Home / Event / Honorary Degrees / 2015 Honorary Degree Recipients / Constance Isherwood, Q.C. 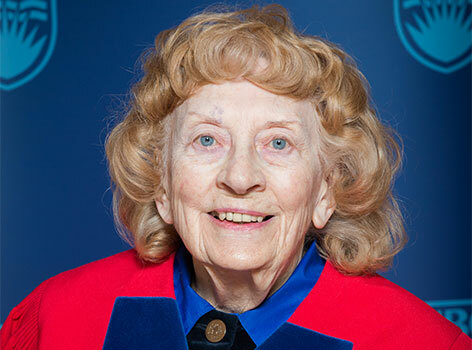 MR. CHANCELLOR, UBC Alumna Constance Isherwood has earned inordinate distinction through almost 64 years in the legal profession, and continues to do so as the most senior practising woman member of the Bar in British Columbia. Mrs. Isherwood was a 1951 graduate of the UBC Faculty of Law and the first woman to receive the Law Society of BC Gold medal for the highest academic standing in her class. She was called to the Bar that same year, joining the Victoria firm of Tait and Holmes where she practised until 1964. She then became a partner in the firm of Holmes and Isherwood where she continues her wide ranging practice today. It is equally notable that Mrs. Isherwood is also a long-serving contributor to her community. Her many activities have included serving as President of the BC Government’s Family and Children’s Services Commission; as an author of the original constitution of the University of Victoria Alumni Association, and as a member of the university’s senate. She has maintained decades of service to the Anglican Church in a variety of roles, including as Chancellor of the Diocese of British Columbia during a challenging time of transition and serious legal issues relating to First Nations communities, residential schools, marriage, human rights and church property. She has also served a number of business and cultural organizations in Victoria and has been active in advancing equity and diversity in the legal profession. Not surprisingly, her list of accolades is extensive, and includes her appointment as Queen’s Counsel in 1998, the Victoria Women’s Pioneer Award in 2012 and the Queen Elizabeth II Diamond Jubilee Medal in 2013. Mr. Chancellor, in recognition of her lifetime of distinguished service and achievement, I ask you to confer the degree of Doctor of Laws, honoris causa, upon CONSTANCE DORA ISHERWOOD.